• Have you been living in Spain or even Mallorca for quite some time? • Would you like to attend a language course for professional or private reasons? • Are you planning to retire in Mallorca and do you want to learn the local language? • Do you finally want to learn a foreign language fast and effectively? Mallorca is the largest and most popular of the Balearic Islands and offers a regional and touristic variety which can be excelled by no other holiday region. The island offers vibrant life, recreation, leisure activities and plenty of entertainment. There is no experience that cannot be found on the island of Mallorca. Sports enthusiasts can choose between numerous activities on the water, on land or in the air. Mallorca is a great place for golfers, travellers and mountain bikers as well as a holiday destination par excellence. Nature lovers will be fascinated by the variety of the island. For travellers there are long and sandy beaches with romantic bays as well as breath-taking mountain ranges. Along the whole coast there are many small picturesque villages. Mallorca is an oasis for holiday enthusiasts like families with children, or visitors who are searching for fantastic offers on leisure and nightlife. Those who don’t wish to be close to the coast can find numerous small places in the interior of the island that have retained their original charm and offer many individual lodgings. The island’s capital Palma de Mallorca needs special mention due to its wonderful old town with many narrow streets, wonderful squares and multiple shopping possibilities. 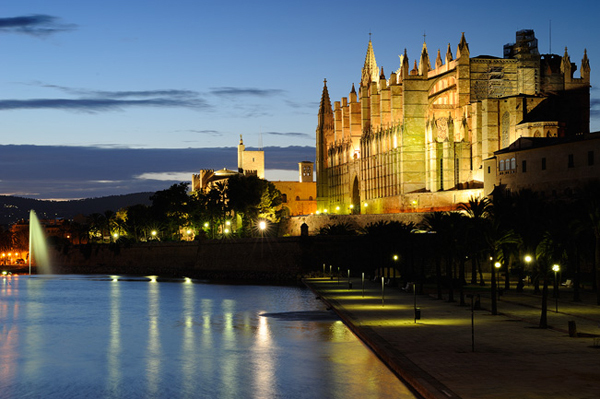 The cathedral of Palma de Mallorca is one of the most popular postcard motives of the island and many other historical places of interest complete the picture. With all these fantastic features Mallorca is an ideal destination for extensive language courses in front of fantastic scenery which contributes to the unique ambience of our courses. Our special select five-star hotels give you the possibility to become immersed completely in the foreign language and to concentrate on the language course. Whether in a rustic Finca, a five-star hotel, at the golf club or in your home - we offer individual solutions for fast and exclusive language learning on the wonderful island of Mallorca.